Do you exercise to manage your Type 2 diabetes? Perhaps you’re pre-diabetic and want to make changes to improve your health? If so, we want to hear from you! This year we’re excited to be launching Step Into Action, a social walk-to-run group in partnership with Diabetes UK Cymru – and your story could inspire others to take those first steps. 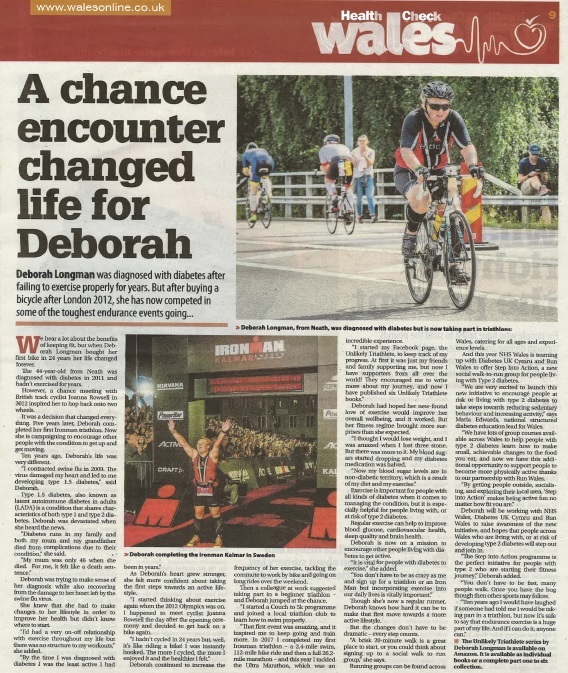 You may have recently spotted Deborah Longman’s story in the Western Mail, outlining her amazing transformation from failing to exercise properly to completing Iron Man Triathlons! Deborah was “devastated” to be diagnosed with LADA (A form of Type 1 Diabetes) in 2011. She hadn’t exercised in years, and started by joining a Couch to 5K group. Fast forward to 2017, and she completed her first Iron Man! Could you inspire others to Step Into Action? Contact us on irun@runwales.org.uk and we’ll be in touch!